My husband and I celebrated thirty years of marriage this past August. My daughter and son-in-law gave us a gift certificate to a nearby bed and breakfast so we could celebrate. Because we had a vacation in September and a lot of fall hiking we wanted to do the rest of the time, not to mention a out-of-town baby dedication and Thanksgiving thrown into the mix, we couldn't enjoy the gift certificate until this past weekend. But, that ended up being a good thing. I don't know about you, but I really get stressed out about Christmas. All the things that need to get done prior to December 25th tend to overwhelm me. So it was so nice to just take a weekend off from all the hustle and bustle of Christmas and just relax! 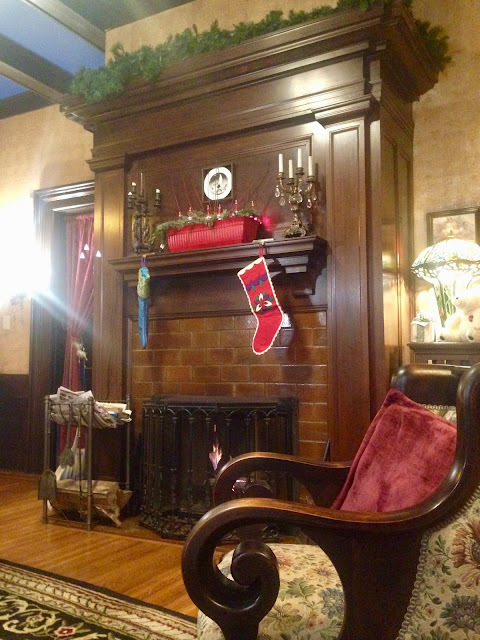 We stayed at the Moondance Inn in Red Wing, Minnesota which is about one hour from our home. 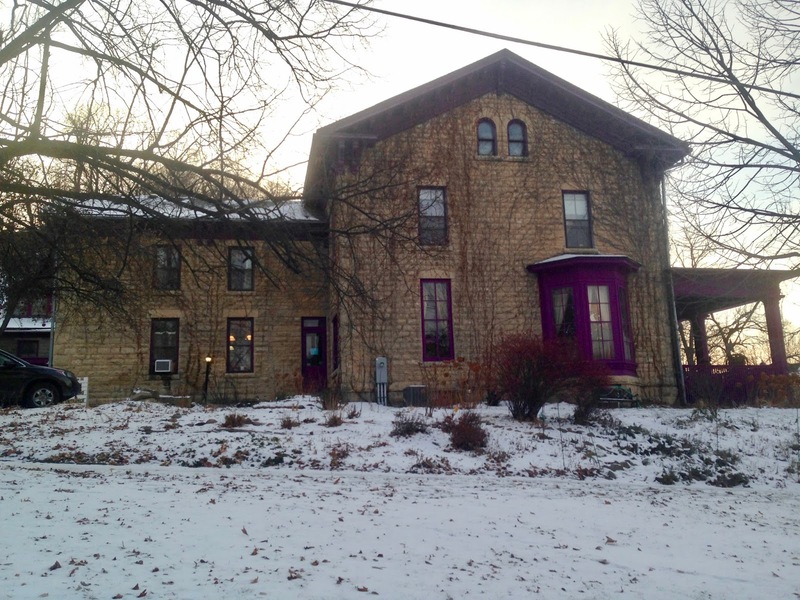 The house was built of 18 inch thick limestone block in 1874. 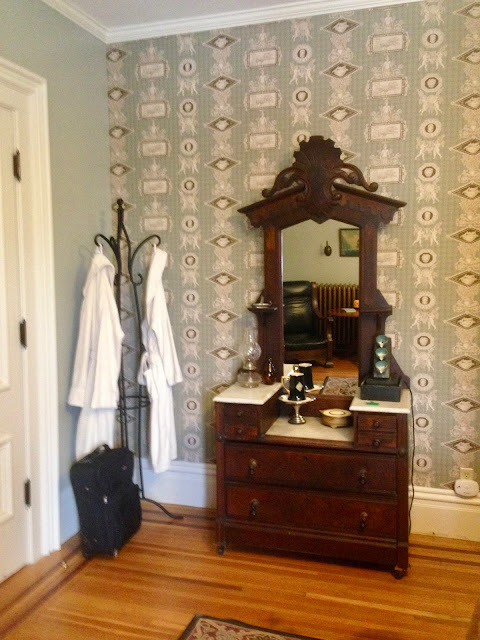 It was originally the home of a Red Wing doctor. The main house is about 6,000 square feet, three floors, plus a finished basement. 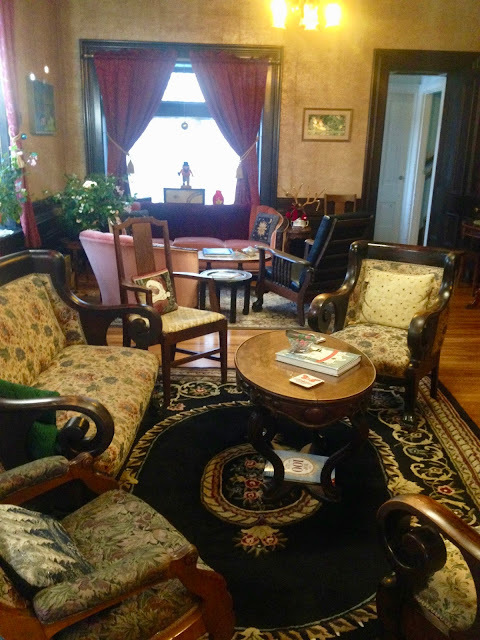 There are five guest rooms, and two floors of public space for guests to use. 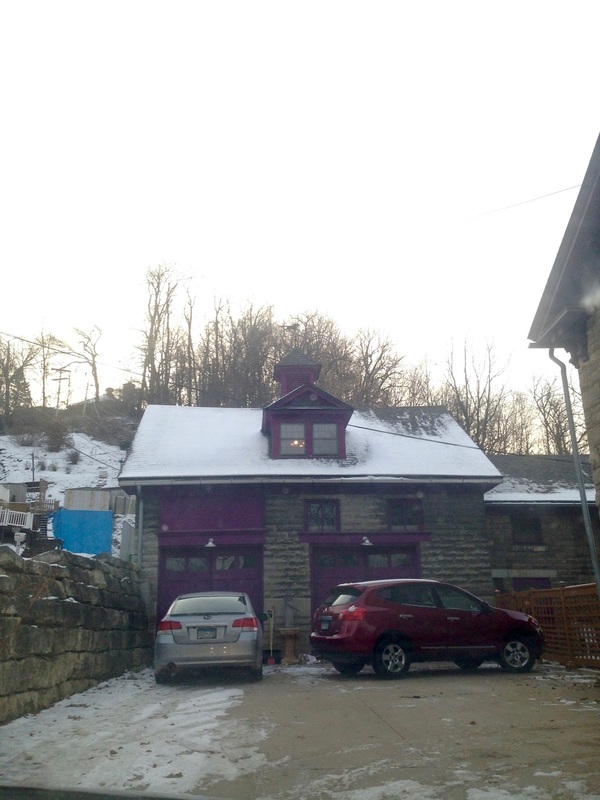 There is also a 1200 square foot carriage house where the owners live. A gorgeous fireplace fills the lobby area. The perfect spot to warm up on a chilly day. 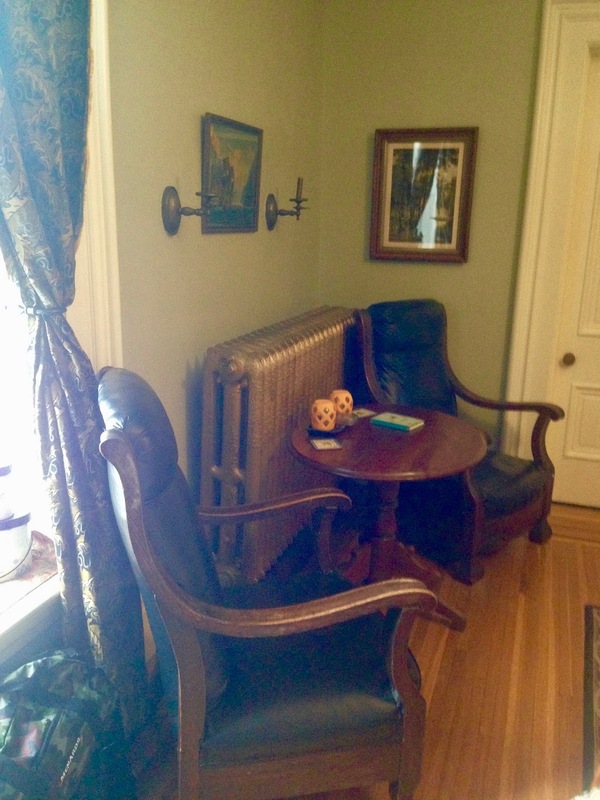 Across from the fireplace is one of the public spaces to enjoy. 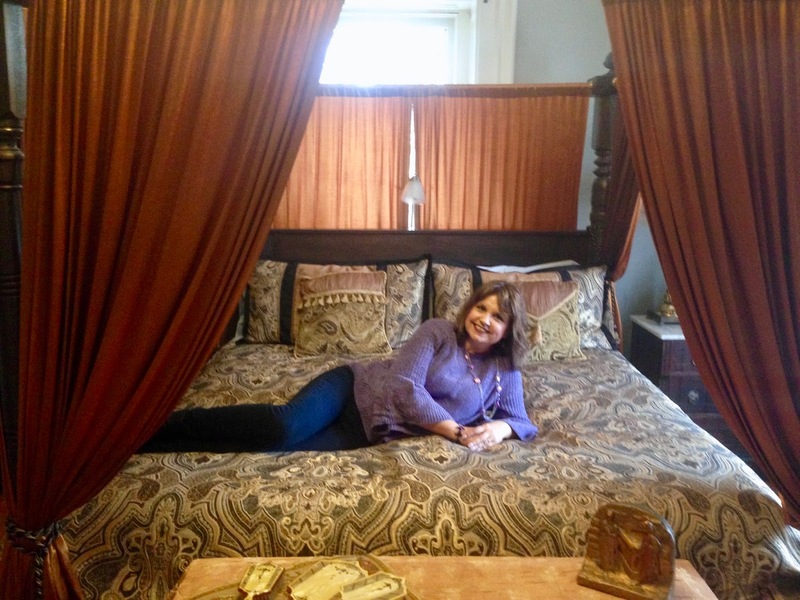 We spent some time here looking at the "Before and After" pictures of transforming the home into a bed and breakfast. They serve wine and appetizers at 5:00 pm for the guests. We were happy to see they had nonalcoholic sparkling juice as well. The home was sparsely decorated for Christmas. They had a few Christmas knick knacks scattered here and there in the lobby, and a giant, gorgeous real Christmas tree! 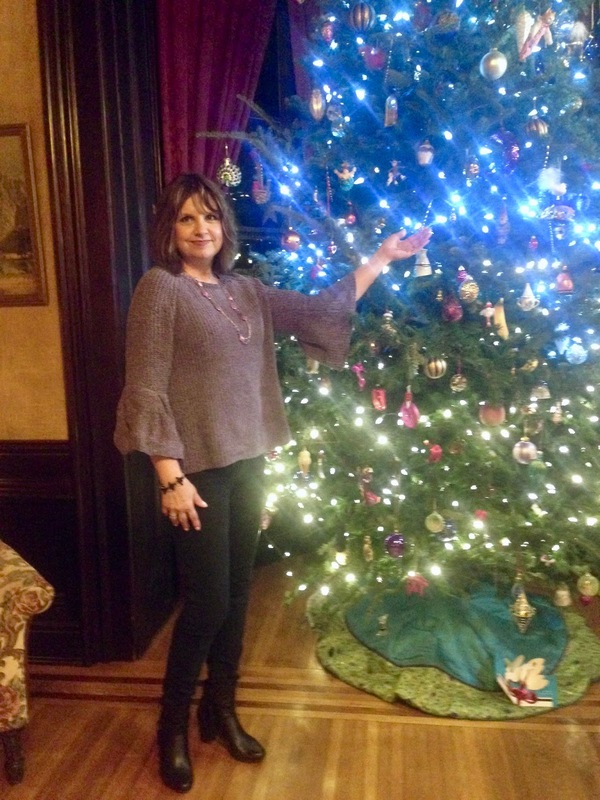 The tree was decorated simply with vintage ornaments. The staircase was absolutely gorgeous with a curved landing a few steps up. I only wish it would have been decorated with Christmas garland. It would have been breath-taking! The upstairs hallway leading to our room. 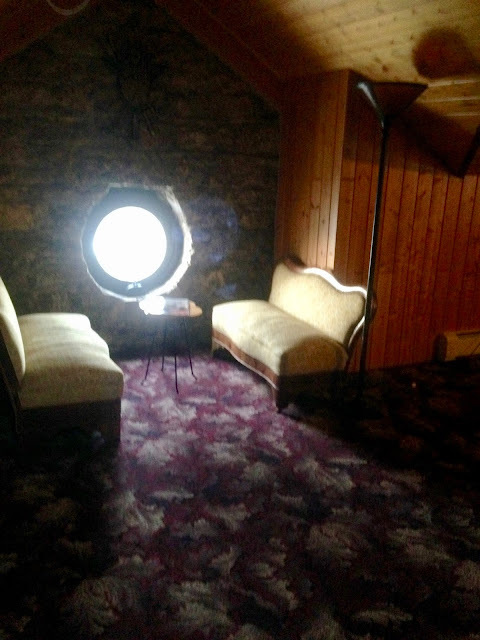 The window above the doorway was right above our spa tub. The owners had two pups, this is one of them. They were allowed to meet the guests, and they even joined us for breakfast. We had our choice of five guest rooms when I made the reservation. We chose this room because it was the only room with a king size bed. It was also the only bed with a canopy, and we thought that would be fun! 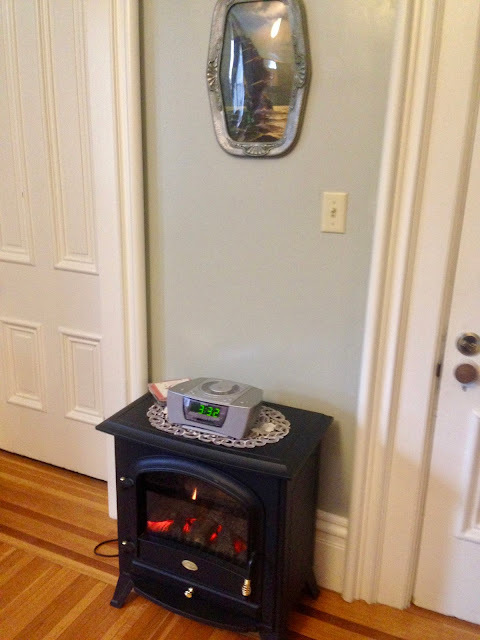 We had a small electric fireplace in our room, and we needed it, because the Inn overall was a bit on the chilly side for us. All the rooms are furnished with antiques. They also provide white robes for guests to use. There are no televisions in the rooms, but they did provide a CD player with three Christmas Cd's. I picked a Bing Cosby one to enjoy. They have a public TV in the third floor living space. They also have free wifi throughout the building. 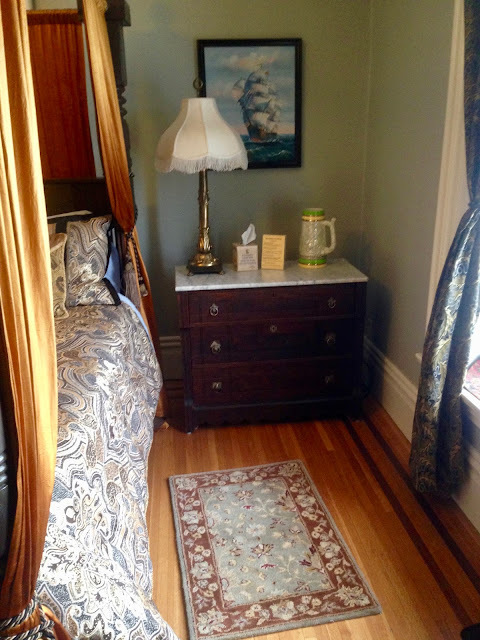 I loved the antique armoire on the side of the bed for hanging my clothes. After we checked out our room and took a few pictures, we went upstairs to see the third floor living space. It was difficult to photograph because it was very dark. It was very spacious. It is a nice living space if a group rents the facility and needs a spot to hang out and watch t.v. or play board games. I really liked the stained class windows, the arches, and the circular windows. You can really see the depth and beauty of the limestone here too! 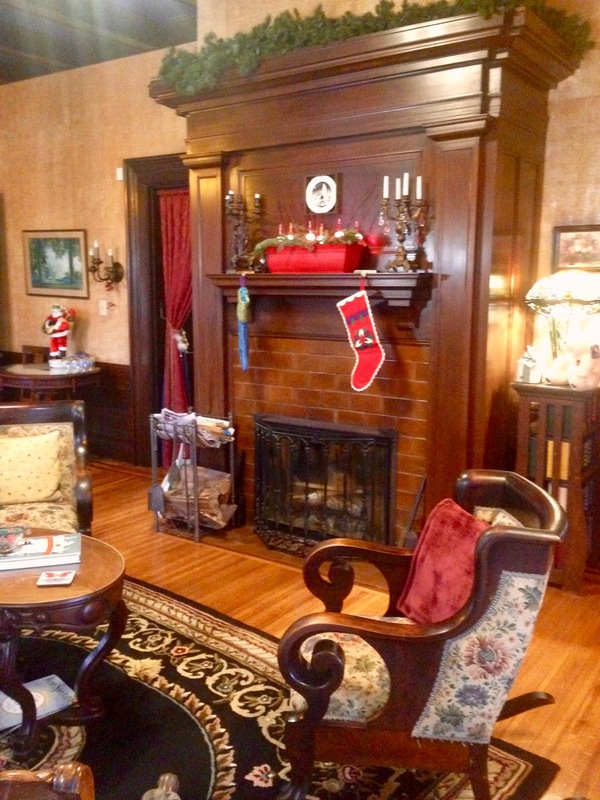 There is another fireplace on the third floor too. When we sufficiently checked everything out at the inn, we headed out for dinner. 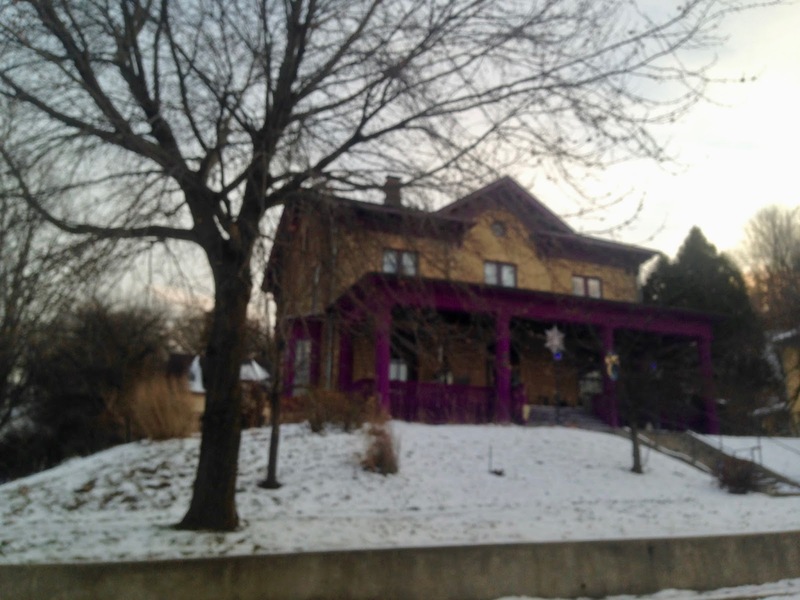 My husband and I had been to Red Wing numerous times before, and headed to a Mexican restaurant we always wanted to check out. 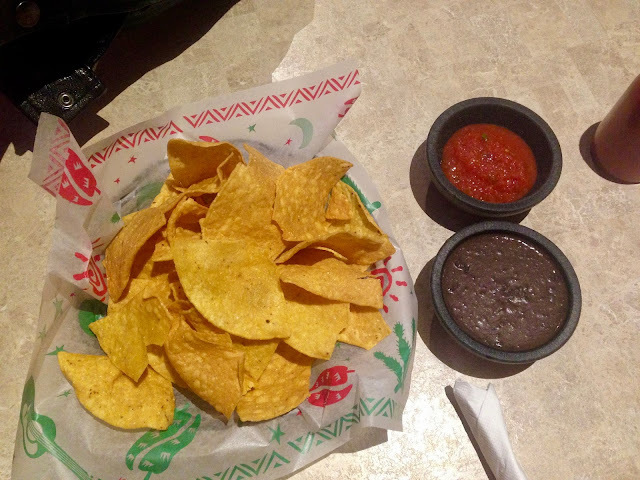 I was thrilled to see this bean dip when they brought out our free chips and salsa. I love bean salsa! It was so good! 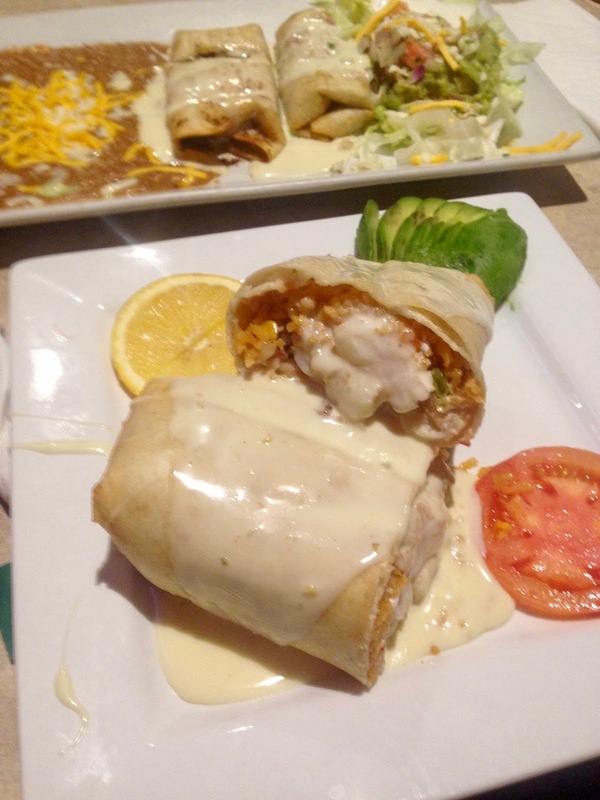 We both ordered chimichangas, but mine (in the foreground) was a shrimp chimichanga and my husband's was a beef. I ended up giving him half of mine, because his were so much smaller and not enough food for him. I really enjoyed the taste of my shrimp chimichanga but I wish it would have also came with a side of beans and a salad like his did. Well, I needed to walk a bit afterward to work off this meal, so we went right across the street to the Red Wing Mall. It was pretty disappointing though to see this mall become less of a retail mall and more of an antique mall. It use to be filled with lots of cute shops, but they have all closed and have been reverted to office space. All that remains is an antique store and a candy shop. After we sufficiently walked off our meal, we decided to head back and enjoy our room. It was so peaceful and quiet. The spa tub was wonderful and so refreshing. I couldn't believe how powerful those jets were. I really need one in my house! Especially during the garden season. The next morning we headed down to breakfast. It was served promptly at 9:00 starting with fresh squeezed orange juice, Parmesan rolls, and fresh fruit. The main course was a thick slab of ham and stuffed french toast. It was delicious! I've never had stuffed french toast before...I didn't even know there was such a thing. It was filled with cream cheese. So good! And finally we had a breakfast dessert! It was awesome! I never had dessert for breakfast before. It was egg nog ice cream served on top of a wafer type cookie and covered with the owners home made caramel syrup. Yum! And may I also add how much I enjoyed the coffee? It was a special blend the owners created with the help of Pepin Blue Cafe Roasters. Oh, it was so good! 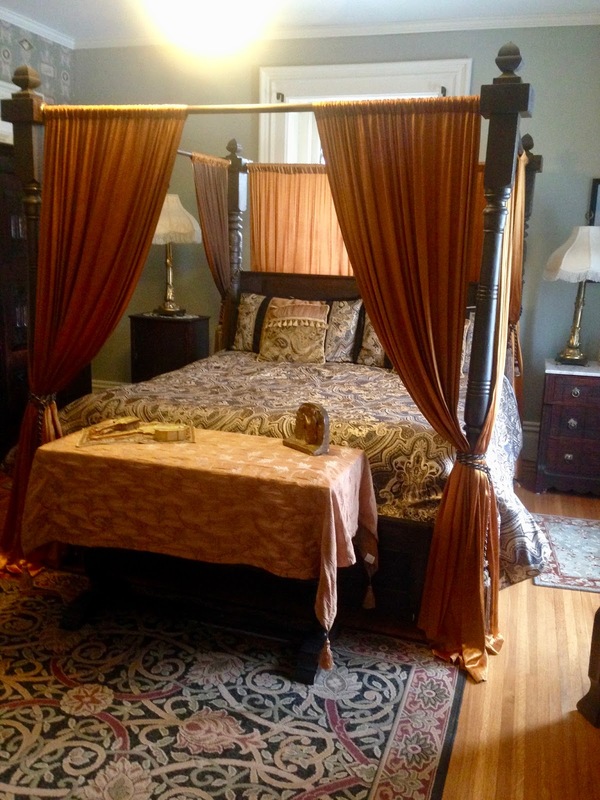 Even though my husband and I have stayed in hundreds of hotels during the course of our travels, this was the first time we had ever stayed at a bed and breakfast. It was quite the adventure for us, and very different from what we were use to. I think B&B's are perfect if you just need to get away from it all and relax. I don't think I would ever stay at one while on a travel adventure because of the set check-in and meal times. We need our lodging to be a bit more flexible than that. What about you? Have you ever stayed in a Bed and Breakfast before? I'd love to hear from you! Happy 30th anniversary! That's just wonderful. The inn looks beautiful and looks like you two had a lovely time. I've never slept in a bed with a canopy, that would be fun! Thanks Brooke! It was a blast! Happy Anniversary! This looks like a wonderful inn and how perfect to get away during the hustle and bustle of the season. I seriously just told my husband the other day that I needed a vacation after all the things I've been running around doing for Christmas. Thank you! Ain't that the truth? Great place to get some decorating ideas. I love the stained glass irises in the windows...oh my this is a place I could love. It was a gorgeous building! There is just something about vintage decorations and furnishings that I absolutely love! What a beautiful place! I stayed in a bed and breakfast a couple of times in Germany and Austria, but it wasn't anything fancy like this. Sad to hear about the mall there. The mall in our town has closed completely, just their two anchor stores are still open - jcp and bergners, but I am not sure how much longer they will stick around...Not good times for many shopping malls! Yes, it is sad whats happening with brick and mortar stores these days. Both my husband and I work or have worked in retail management and found that shoplifting and the struggle to find good employees is a huge part of the problem too. What a special gift, and congratulations on such a huge milestone! This looks like it was a great trip for the both of you. I love those giant bed posts too! Thanks Shauna, if was a special gift. I have such great kids! What a quaint, lovely place for a weekend away. Have enjoyed the photos here and on Instagram. Glad you and your PC were able to have this quiet time together after the hub-bub that was your fall and the anticipation of the holiday bustle. So beautiful Amy and yes it certainly is the right setting for romance. Thanks for supporting us and linking up at #overthemoon. Have a wonderful Christmas and New Year and see you in 2018! I love BnBs--haven't stayed in one for a few years but so relaxing! Thanks for sharing at Party in Your PJs.